WHAT CAN FISH TEACH US ABOUT OUR CLIQUE AND OURSELVES? We’ve all been there — at the theatre for an evening with friends who unapologetically veto your movie suggestion. Woefully, and despite your best effort to convince the group otherwise, you ended up sitting bemused through what felt like an eternity of moving images. Did the concession to give up your movie pick influence your clout within the group? How did you feel about yourself and your friends? According to Laurier Associate Professor of Psychology Noam Miller, you may have a thing or two to learn from fish. Collective animal cognition and personality is Miller’s expertise, and with funding from the Natural Sciences and Engineering Research Council of Canada, he is exploring how groups can cause missed learning opportunities, future decisions and collective behaviour. In his collective cognition lab in Laurier’s Department of Psychology, Miller works with zebrafish, a small schooling species from northern India and Nepal used by geneticists, developmental biologists and neuroscientists. Following his work in animal behaviour during his undergraduate studies, Miller worked with individual zebrafish during his doctorate at the University of Toronto. Finding it frustrating to train them, Miller decided to study something they do on their own — schooling and swimming in groups. Examining how groups of zebrafish move around together and how their group behaviour depends on environmental factors became central to his research. “Human cases are a lot more complicated than animal situations, but at least fundamentally we hope that there are similar processes happening." Researchers can observe and measure several different dimensions of animal behaviour, including aggression, boldness or explorativeness, and sociability. And similar to humans who exhibit behavioural syndromes, researchers can find consistent patterns and differences between individual fish. Miller is exploring whether there is an evolutionary advantage to having a certain characteristic such as boldness or shyness vary within a population. Different phenotypes may be advantageous in certain environments, such as making a group faster or more accurate at foraging or avoiding predators. Miller is also interested in how and why fish naturally choose their own groups. “We don’t pick our children’s friends and say, ‘Okay, you’re bold so I’m going to put you in a group with other bold kids.’ How that’s decided is really complicated, but generally children go into the school population and end up with a group of friends,” says Miller. He is interested in simulating this experience in fish — letting them choose their own group and then asking what the characteristics of the individuals of these groups look like. “Human cases are a lot more complicated than animal situations, but at least fundamentally we hope that there are similar processes happening,” says Miller. In addition to movement, there are important dynamics of cooperation and competition common to both human and animal groups. “If I’m following a group to get food, will there actually be any left when I get there? Maybe I shouldn’t be following; maybe I should be leading,” says Miller. This leads to the question of how conformity and collective influence impact the individual decisions of humans and animals: they must constantly balance the individual information they have with the social information they have — or what everyone else is doing. How cognition is shaped by its social context — and how different animals solve the same challenge of balancing personal preference versus the cohesion of the group — is a key research question being studied by Miller and his lab. It’s something worth considering the next time you’re stuck watching your least preferred movie pick. The photo used in this story is by Ariana Strandburg-Peshkin. 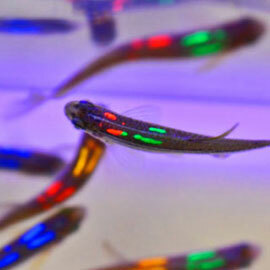 It shows zebrafish, each three to four centimetres long, tagged using a fluorescent elastomer. Using UV light to make the tags fluoresce, Miller’s lab can identify individual fish and their behaviour in tanks.